"We are building a 500,000 capacity and we would like members of this church to support us, if God has laid it on your heart please come forward" Nelson had just got land to build his house, it was a project he always dreamed about and now he had the land and the money. When he heard the call he simply ignored, he had been part of other projects, God would understand this time. On Monday, Nelson sat with his architect and released some money for work on the foundation to start. After a week he didn't hear from the architect and his phone wasn't going through, so he got another architect, it was just one problem after the other until he was praying one day and the Holy Spirit showed him a scripture in Haggai 1:9 "You expected much, but see, it turned out to be little. What you brought home, I blew away. Why?" declares the LORD Almighty. 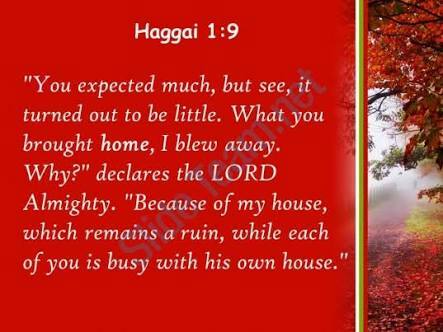 "Because of my house, which remains a ruin, while each of you is busy with your own house. It dawned on Nelson that it was important for him to put God's work first, he began to partner with his church in their building project and miraculously the two architects came back and decided to work for free to redeem their image. In 3 months Nelson had built his house and still partnered with the church project. Whenever your church is doing a project be very excited because if God opens your eyes you will realIse it's an opportunity to move to your next level. When you partner with God He partners with you, when you put God first, He will put you first. Your business cannot suffer if you don't let God's work suffer. Let me tell you a secret; IF YOU TITHE FROM YOUR SALARY YOU WILL SOON HEAD THAT ORGANISATION OR GOD WILL GIVE YOU YOUR OWN BUSINESS! You cannot mistreat a tither at work, God will deal with you! Be on the lookout for any opportunity to partner with God, God is the best business partner you can ever have. You too can be a social media evangelist. Please share so that others can be blessed as you have been blessed.